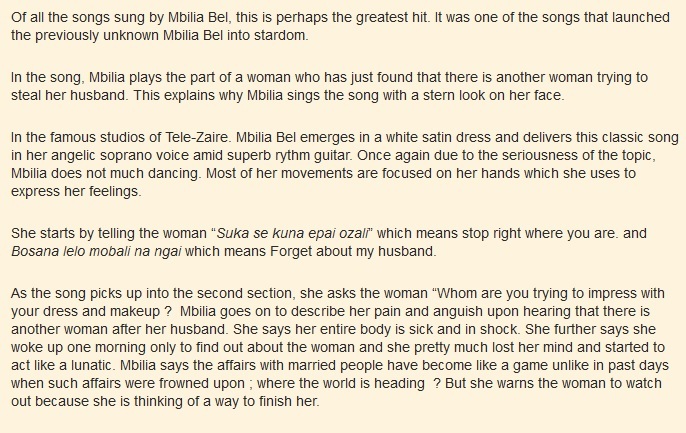 This entry was posted in Songs, Tabu Ley& Afrisa Songs and tagged Afrisa International, Mbilia Bel, mbilia bel songs, Tabu Ley. Bookmark the permalink. The translations of these gems are really enlightening and so refreshing,could you be having “sambuluma” of Rochereau and the translated lyrics ? thanks. really this song make me crazy. I really like it. mbilia Bel is good at delivering messages. I also like the way she and the late Tabulay paired on stage. mabila Bel. she’s got the most sweet voice Africa has ever produced. he songs make my heart melt. and she is her role model to other women in her style of dressing.